Recommended for babies 3 months and older. 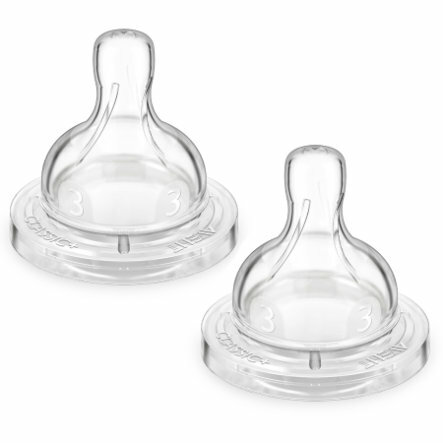 Its soft wide shape encourages your baby to open the mouth wide when feeding and to literally 'latch on' to the teat. He or she can then suckle, using the same movements of tongue and jaw as when breastfeeding. That's why it's easier to combine breast and bottle feeding with AVENT. A unique patented skirt system with a one-way air valve at its base, flexes to allow air into the bottle, replacing the milk at your baby's own suckling rhythm andeliminating the vacuum. Your baby can feed continuously, as at the breast, without having to 'come up for air'. The whistling sound you hear is your guarantee that air is going into the bottle and not into your baby's tummy. It's the air babies swallow during feeding that can cause the discomfort, crying and fussing associated with colic. • Extra fast flow - also suitable for thicker fluids. The flow can be varied by twisting the bottles so that the I, II or III lines up with the baby's nose.